This picture from Andrew Gelman is striking. 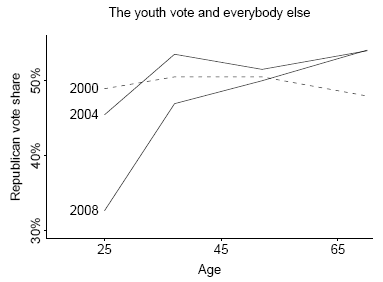 It suggests that the major difference between the past two elections and this one was the youth vote. In this election, the young left the Republican party in droves. Why? I am not enough of a political scientist to be sure, but recent conversations I have had with some Harvard undergrads have led me to a conjecture: It was largely noneconomic issues. These particular students told me they preferred the lower tax, more limited government, freer trade views of McCain, but they were voting for Obama on the basis of foreign policy and especially social issues like abortion. The choice of a social conservative like Palin as veep really turned them off McCain. So what does the Republican Party need to do to get the youth vote back? If these Harvard students are typical (and perhaps they are not, as Harvard students are hardly a random sample), the party needs to scale back its social conservatism. Put simply, it needs to become a party for moderate and mainstream libertarians. The actual Libertarian Party is far too extreme in its views to attract these students. And it is too much of a strange fringe group. These students are, after all, part of the establishment. But a reformed Republican Party could, I think, win them back. Can the Republican Party move in this direction without losing much of its base? I have no idea, but for the GOP, that seems to be the challenge ahead.